We did an SCA (School Construction Authority) job for PS 96 in the Bronx yesterday. As a little bit of knowledge, PS 96 is part of New York City Public Schools, which is the largest system of its kind in the United States of America. 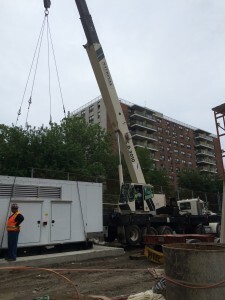 We unloaded a 19,000 pound generator and set onto a pad so that it could be hooked up for use. It was a quick job, but executed flawlessly.